The RRS held its monthly meeting on Friday, March 9, 2018 at our usual location at the Ken Nakaoka Community Center. We got a timely start at 7:31pm. After the reading of the treasury report, we proceeded to discuss the agenda items. 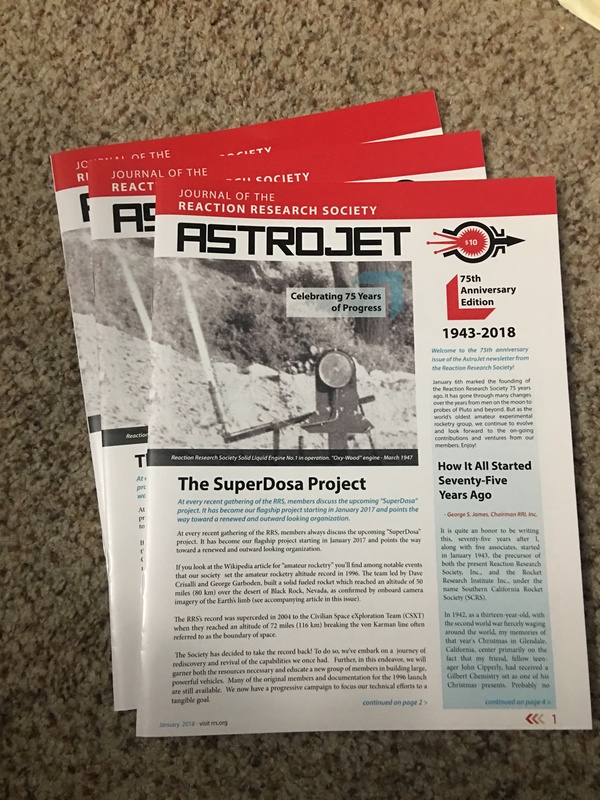 The first item is the release of the Astrojet newsletter. We’ve sold the first twenty copies already. Copies are $10 each and proceeds go to benefit society activities in this 75th anniversary year. The RRS’s newsletter hasn’t been in print for nearly 20 years. The RRS is very proud to offer a tangible token for the public’s reading pleasure. The RRS is grateful to member Bill Janczewski for making a very professional looking newsletter to commemorate this milestone year for our society. 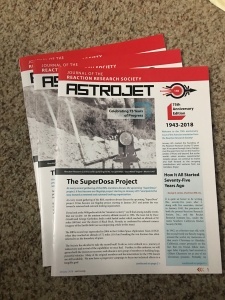 75th anniversary issue of the Astro-Jet is now on sale for $10/copy. 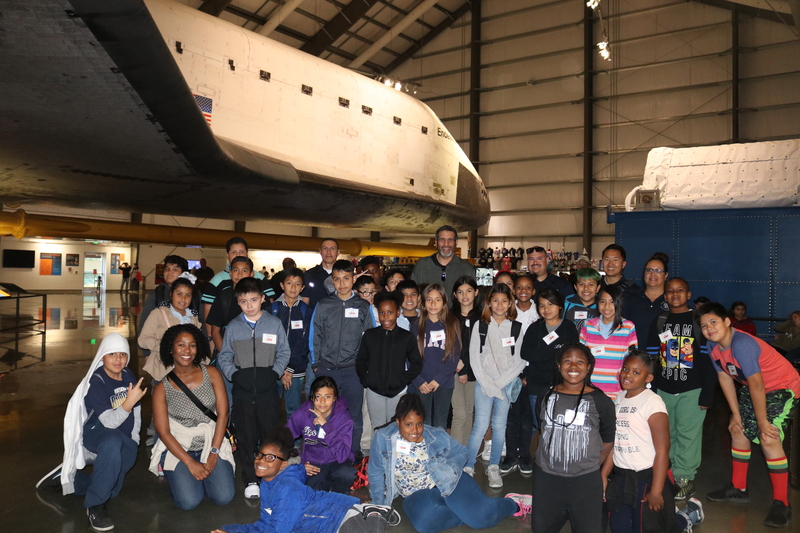 The second item on the agenda was to get an update on the on-going RRS educational event with the students at Florence Joyner Elementary supported by the growing and successful LAPD CSP program. The program that started in February is going well and the students were able to visit the California Science Center as part of the five session program. The rocket build was completed today and the painting will commence on Saturday. Frank had the students make the paper tube rockets for use with the air launcher. The launch event at the MTA was rescheduled to April 7th. The forum has also been updated with this change. Frank has compiled a lot of educational materials from the many Powerpoint presentations over the last few classes, but the amount of material is getting pretty large. Some work should be done to pare down the content to have a greater impact to our younger audience. Also, Frank has bound the information in a booklet which might make for a fine publication as we refine our content with the great questions we get from the students. For the third agenda topic, we discussed the progress on the RRS symposium. All is going very well and our speaker list is nearly fully confirmed. We held our first teleconference and will hold the next one on Tuesday, March 13th to continue the many planning activities left. 116 free tickets on Eventbrite have been sold already. Frank has been putting out flyers to local high schools such as Redondo Beach, Torrance, and Gardena. We ask all members to download the flyer and spread the word to colleagues, friends and other fans of rocketry both past and present. The RRS 75th anniversary symposium will be Saturday, April 21st, 2018 and will have speakers and exhibitors from academia, industry and government agencies on topics related to professional and amateur rocketry. If there are any questions, please contact Frank Miuccio our society vice president and symposium coordinator. At the symposium, the RRS would like to show photos of people and projects throughout our long history. We have received a lot of great items from members past and present and we encourage everyone to contribute whatever they can to the on-going RRS history project. In particular, photos, articles or stories from the 1970’s and 1980’s are of particular interest to us as we have little from this time period. I am happy to lead this project and hope to give a nice montage to display before all of our symposium attendees and also invite people to write articles describing their experiences and past projects with the RRS. It is through storytelling that the RRS history is kept for future generations to learn and appreciate those that have come before us. Please email the RRS secretary if you have anything to share for the RRS history project. On the next agenda topic, we discussed the possibility of moving the meeting start time to 7:00PM. The purpose was to try to have more time to discuss the growing activities at the RRS. The RRS is growing and the meeting time is important. After some discussion, it was decided to keep the meeting time at 7:30PM. The meetings will start on time and discussions will have to stay on the topics of the agenda. Many people come from great distances, but if other topics want to be discussed they can be done before the meeting starts. For the next topic, a lot of progress was made on the horizontal thrust stand that will be used at the MTA on the small concrete slab just in front of the old blockhouse at the MTA. 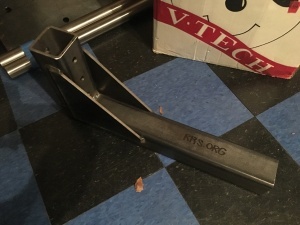 I had the load cell adapter pieces made and they fit quite well. Many thanks to Matt Moffitt of CNC Specialty Machining in Huntington Beach. 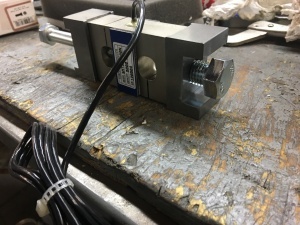 The horizontal thrust stand will go out to the MTA on the April 7th launch event, but this will be only for final fit checks. Osvaldo is also helping with getting the last mating hardware pieces to complete the set. 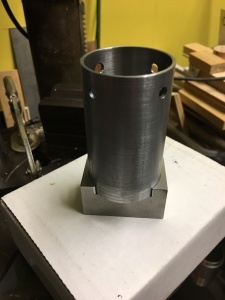 The main frame pieces were welded, but we will not be able to use the thrust stand at the next launch event until the foot plates are aligned and welded. Many thanks to Jim Shirley of Shirley Design and Custom Fabrication in Huntington Beach for his welding skills. I hope to complete the thrust stand and have it ready to static fire alpha rockets at the next launch event after April 7th. Richard spoke briefly about the progress he’s made to date on his liquid rocket vehicle build. The RRS standard liquid rocket will be the result of a few builds and a lot of testing to arrive at what will be a practical and effective standard design. 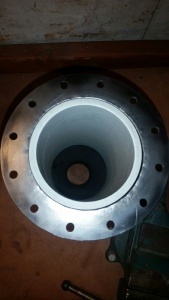 Richard has built his thrust chamber with a G10 fiberglass internal liner insert and a graphite nozzle. 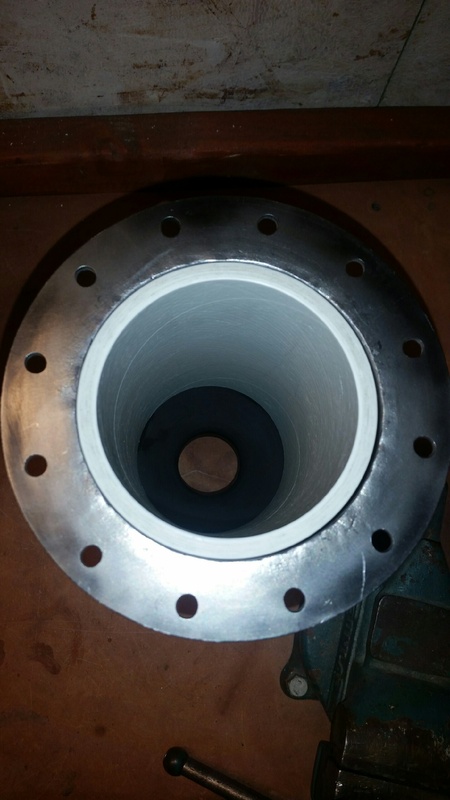 Richard found a good supplier of fiberglass tubes and pipes that are sold in convenient 5-foot lengths. Richard’s design also includes a pintle-type of injector which is in the works. We hope to see more details when he finishes this piece in the coming month or so. The last agenda topic was about that fact that we are flying a lot of alphas, but few of them have payloads besides the smoke grenade which works well to help spotting them in flight at apogee. I have looked into making flight speed sensor and my parachute system. I am hoping this will be a semi-regular topic in future meetings. A future topic for next month’s meeting will be to discuss the pyrotechnic operator’s exam. Licensing is done by the California Fire Marshall’s office and it is an important qualification to have. The RRS is working to get more members trained to help us expand our rocketry activities at the MTA and help us expand knowledge about safety in our hobby. The meeting adjourned at 9:03pm. The next RRS meeting on April 13th will likely be spent working on the final details of the RRS symposium which will take place 8 days later at the same Ken Nakaoka Community Center in Gardena, Saturday, April 21, 2018. If there is anything from the meeting that I missed or misstated, please let me know. I am also trying to keep the email list updated. Please let me know if anyone isn’t getting the meeting notices.